Hello! I hope everybody is having a great weekend so far :) I just wanted to say that I am so glad I decided to do a GIVEAWAY because everybody has been writing such nice comments!!! Seriously, I'm blushing here ;) I can't wait to find out who wins - but there is still another week to enter! Tell your friends! Also if you haven't already, check out the giveaway that the rik rak studio is doing right now to say thanks to all of her sponsors - and yes I am one! So if you don't happen to win this my giveaway :( you still have another chance with the rik rak giveaway! In other news, I spent the day yesterday at the Saskatoon Quilters Guild Quilt Show - not really my thing to do but my mom wanted to go so my sister and I packed up the baby and went to meet grandma at the show :) And I was just absoloutely blown away with some of the quilts that I saw there. Unreal! I am including some of the pictures I took there with this post. Have a Wonderful Weekend! Until next time, Kim XO. This weeks' installment of TGIF - get ready to shop, shop, shop is inspired by my love of bags :) Infact I recently purchased one from bayanhippo after weeks and weeks of "window" shopping (which is ALWAYS fun ;) ) and a couple more weeks of deciding which one I loved the best. I finally decided on one of course, but it is my goal with this post to make that job easier for you - my readers! So I have picked a small selection of great bags in several different styles and hopefully you find one you love :) Have fun!!! 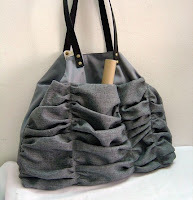 My first pick is this great Ruffles in grey with leather strap by lovejanice . 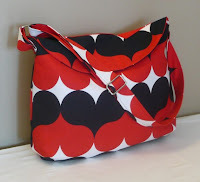 This is the perfect shoulder bag - it is roomy without being too large, its got lots of pockets (very important! ), made out of a sturdy material (cotton twill and linen), and the ruffles dress it up so it doesn't look too utilitarian! I even love the grey, and you can never go wrong with a neutral! 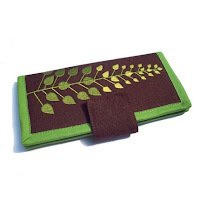 Speaking of cute accessories to tuck into your shoulder bag - here is another great one, the Embroidered Wallet - Sage Branches on brown by LBaccessories. I love this wallet! 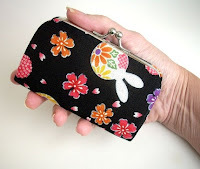 Great colour combination, great fabric choice (linen), lots of pockets inside to hold all your cards and money, and I especially love the embroidery on the outside. One of the things I always look for when I am deciding on a bag/wallet purchase are these kinds of details - they make the item feel a little more personalised and thats always a great thing! If you are looking for a roomy shoulder bag that is also 100% vegan, 100% natural, and 100% sustainable then this Large Vegan Weekender in Brick and Butternut by pansymaiden is the one for you! There are a ton of pockets, a key fob, and a large zippered pocket on the exterior of the bag, as well as the two deep "hoodie" pockets on the front of the bag for organisation. 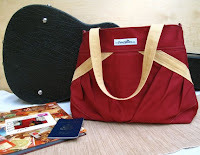 This bag also comes a variety of colours and there is also a detachable shoulder strap. In the market for something really fun???? 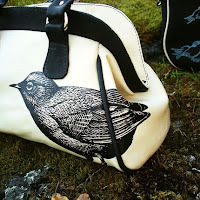 ;) The Black and Cream Leather Doctor Bag with Dipper Bird by bonspielcreation has been on my "bag radar" for ages! I love the shape, the lining, the colour, and of course the screenprint of the Dipper Bird on the front - truly unique! There is also a wide assortment of smaller leather accessories in the shop, including wallets and card holders, and all are screenprinted with cute little pictures. You need to check out this shop! 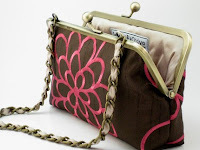 Moving on to something more for a night out on the town.... first is this Raspberry Chocolate Cake - 8 inch Silk lined Frame Clutch Bag by DavieandChiyo . The clutch is made with dupioni silk (inside and out) and then is embroidered with this beautiful bright pink flower. It also features a detachable ribbon laced chain. 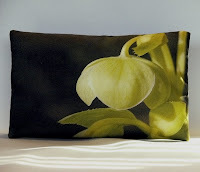 This great little clutch is very versatile and would compliment many different outfits! Happy shopping :) Until next time Kim XO. I am pleased to report my giveaway is going well, I am really encouraged by the results. I know that a couple of people have had troubles signing up through Google but DON'T WORRY :) You're comments have been entered into the giveaway. I completely understand that Google can be a little stupid :) sometimes! I am also participating in a giveaway on the rik rak studio - if you don't already know, I run an ad on Kristal's blog and she is kindly offering a $25 gift certificate to the winner that can be used in any of her sponsors shops. Go here for a list of her sponsors and all the details of the giveaway!!! Have a WONDERFUL Wednesday :) Until next time, Kim XO. 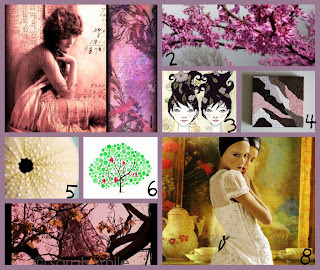 This weeks Wishlist Tuesday post is about dressing up your walls! If you have been reading this blog awhile you would know that we recently moved into a new house - so I have been really drawn to bright, colourful, original, and of course handmade works of art :) I don't discriminate either, I like photography, paintings, collages, prints... so here is a selection that I am particularly drawn to. Enjoy! As always, until next time, Kim XO. One-of-a-Kinds section in my Etsy shop. email address too so I can contact you if you win! Giveaway is open for 2 weeks, and closes 12pm EST on Nov 1/2009. The winner will be chosen at random using Random.org's random number generator. Once we have a winner, I will contact them and they can select the piece they want!